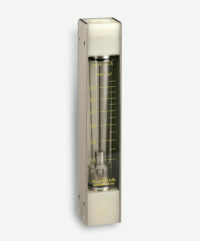 Kytola variable area flow meters in the Model KL range are constructed from a heavy-duty polymer flow tube protected by stainless steel side plates and robust end blocks in aluminium, AISI 316 or polymide. Model KL instruments are designed to be durable and reliable in industrial applications such as water treatment, sealing water measurements in vacuum pumps and oil measurements. Similar products in this range include the Model K and Model KD.